The NASA/ESA Hubble Space Telescope, in collaboration with ground-based observatories, has at last confirmed what philosopher Emmanuel Kant and scientists have long predicted: that planets form from debris disks around stars. More than 200 years ago, the philosopher Emmanuel Kant first proposed that planets are born from disks of dust and gas that swirl around their home stars. Though astronomers have detected more than 200 extrasolar planets and have seen many debris disks around young stars, they have yet to observe a planet and a debris disk aligned in the same plane around a star. Now, the NASA/ESA Hubble Space Telescope, in collaboration with ground-based observatories, has at last confirmed what Kant and scientists have long predicted: that planets form from debris disks around stars. The Hubble observations by an international team of astronomers led by G. Fritz Benedict and Barbara E. McArthur of the University of Texas, Austin, USA, show for the first time that a planet is aligned with its star's circumstellar disk of dust and gas. 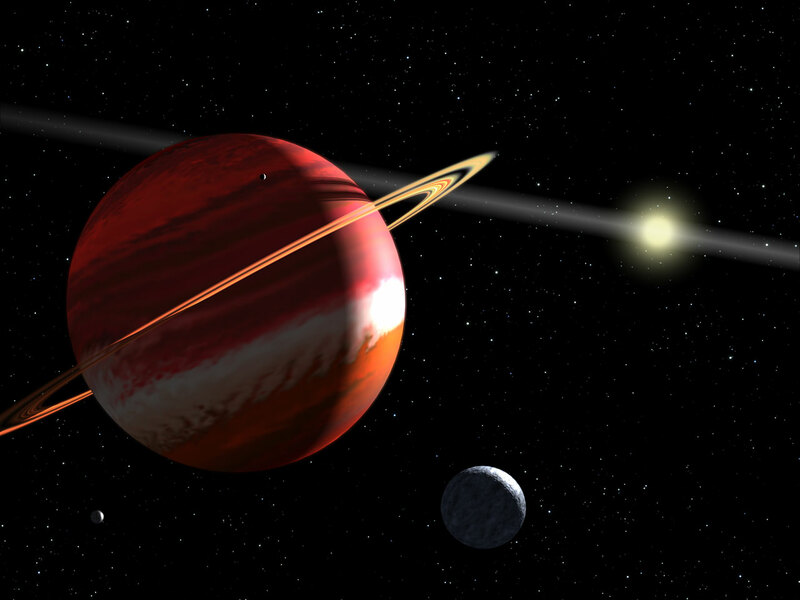 The planet, detected in year 2000, orbits the nearby Sun-like star Epsilon Eridani, located 10.5 light-years from Earth in the constellation Eridanus. The planet's orbit is inclined 30 degrees to Earth, the same angle at which the star's disk is tilted. The results will appear in the November issue of the Astronomical Journal. "Because of Hubble, we know for sure that it is a planet and not a failed star," McArthur explained. Some astronomers have argued that a few of the known extrasolar planets could be brown dwarfs because their precise masses are not known. If an object is less than 10 Jupiter masses, it is a planet, not a brown dwarf. McArthur was part of an earlier team at the University of Texas at Austin's McDonald Observatory who discovered Epsilon Eridani b. They detected the planet using the radial-velocity method, which measures a star's subtle motion toward and away from Earth to find unseen companions. The current Benedict-McArthur team calculated the planet's mass and its orbit by making extremely precise measurements of the star's location as it wobbled on the sky, a technique called astrometry. The slight wobbles are caused by the gravitational tug of the unseen planet, like a small dog pulling its master on a leash. The team studied over a thousand astrometric observations from Hubble collected over three years. The astronomers combined these data with other astrometric observations made at the University of Pittsburgh's Allegheny Observatory. They then added those measurements to hundreds of ground-based radial-velocity measurements made over the past 25 years at European Southern Observatory in Chile, McDonald Observatory at the University of Texas, Lick Observatory at the University of California Observatories, and the Canada-France-Hawaii Telescope in Hawaii. This combination allowed them to accurately determine the planet's mass by deducing the tilt of its orbit. If astronomers don't know how a planet's orbit is tilted with respect to Earth, they can only estimate a minimum mass for the planet. If only the radial velocity wobble along the line of sight is known, the planet's mass could be significantly larger if the orbit were tilted to a nearly face-on orientation to Earth. The star would only move toward and away from Earth slightly, even though it had a massive companion. "You can't see the wobble induced by the planet with the naked eye," Benedict said. "But Hubble's fine guidance sensors are so precise that they can measure the wobble. We basically watched three years of a nearly seven-year-long dance of the star and its invisible partner, the planet, around their orbits. The fine guidance sensors measured a tiny change in the star's position, equivalent to the width of a Euro coin 1200 km away." 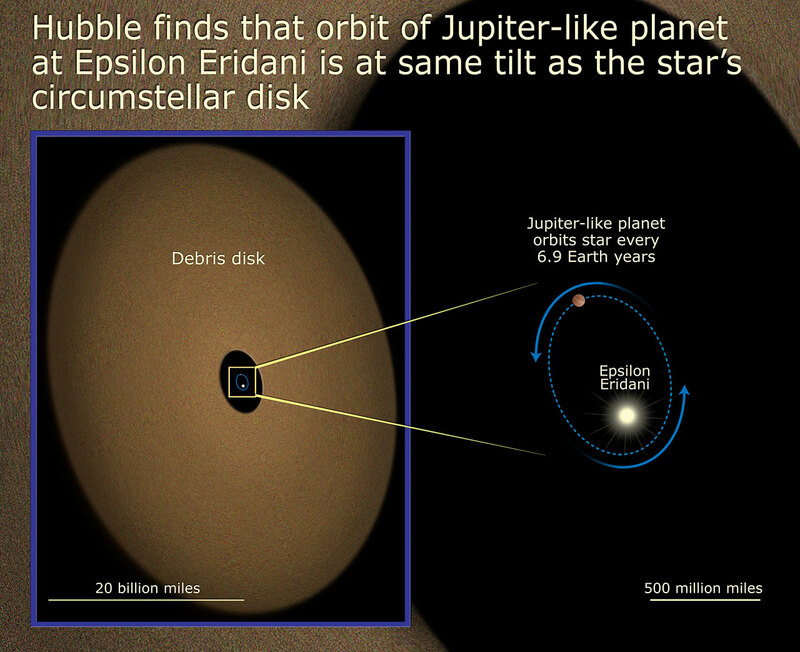 Epsilon Eridani has long captivated the attention of science fiction writers, as well as astronomers. In 1960, years before the first extrasolar planet was detected, astronomer Frank Drake listened for radio transmissions from inhabitants of any possible planets around Epsilon Eridani as part of Project Ozma's search for intelligent extraterrestrial life. In the fictional "Star Trek" universe, Epsilon Eridani is considered by some fans to be the parent star for the planet Vulcan, Mr. Spock's home. No Vulcan or any other alien could live on this gas giant planet. If moons circled the planet, they would spend part of their orbit close enough to Epsilon Eridani to have surface temperatures like that of Earth, and possibly liquid water. However, the planet's looping, "roller-coaster" orbit also would carry the moons far away from the star, a distance equal to Jupiter's 800-million-kilometre separation from the Sun, where oceans would freeze. If a moon were massive enough, like Saturn's giant moon Titan, it could have a sufficiently dense atmosphere that would retain heat. Such an atmosphere would suppress wide swings in surface temperatures, like covering up with a heavy blanket on a cold night. This could make such a moon potentially habitable for life as we know it, Benedict said. The members of the science team are G. Fritz Benedict, Barbara E. McArthur (McDonald Observatory, University of Texas), George Gatewood (Allegheny Observatory, University of Pittsburgh), Edmund Nelan (Space Telescope Science Institut), William D. Cochran (McDonald Observatory, University of Texas), Artie Hatzes (Thüringer Landessternwarte Tautenburg), Michael Endl, Robert Wittenmyer (McDonald Observatory, University of Texas), Sallie L. Baliunas (Harvard-Smithsonian Center for Astrophysics), Gordon A. H. Walker, Stephenson Yang (University of Victoria), Martin Kürster (Max-Planck-Institut für Astronomie), Sebastian Els (Cerro Tololo Interamerican Observatory) and Diane B. Paulson (Goddard Spaceflight Center).